If you're an Xbox One owner who has yet to step into the cowboy boots of Arthur Morgan in Red Dead Redemption 2, today's your lucky day. Walmart is offering Rockstar's latest Wild West open-world adventure at a just-below-MSRP $59.89 - but to sweeten the deal, it's also bundling it with a $10 Xbox One gift card. In other words, you're basically getting 10 bucks for doing nothing besides buying an amazing game. Even with plenty of Black Friday Xbox One deals around the corner, there's no need to wait on this particular deal - it's highly unlikely that you'll find many discounts for Red Dead Redemption 2 next week given how new and popular it is. 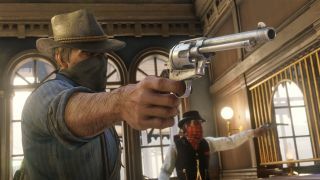 Heck, you don't even have to spend the $10 gift card right away - you can save it for when Red Dead Online kicks off and no doubt brings microtransactions along with it. Walmart's even doing the kindness of throwing in free 2-day shipping. So hyah - get up on that horse and giddyup over to the checkout with your credit card info in hand, y'hear?